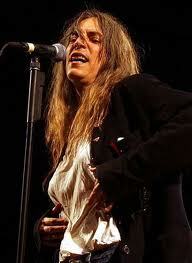 The eager multitude got an adult dose of Patti Smith Thursday night, July 13,2000 at Mississippi Nights. She was resplendent in all her varied but related representations. Patti the strutting, bellowing, bellicose, wailing rock singer; Patti the intense, demonstrative, artful poet; Patti the incantatory punk priestess; Patti the chatty, affable earth mother; Patti the confrontational political provocateur they all presented themselves at various times throughout the over two hour concert. Only an artist possessing her unique and creative oeuvre, could have given this kind of show. She drew from and acknowledged, sometimes directly, antecedents and influences from Blind Lemon Jefferson to Robert Mapplethrope. Smith and her three piece band opened with the eerie “Waiting Underground” from her 1997 Peace and Noise c.d. She then primed the anticipatory throng with a invocative reading of “Spell”, which is Allen Ginsberg’s Footnote to Howl. It was concluded with Patti joining her guitarists and drummer with a bleating, honking clarinet improv. Already from this point of the event, this powerful performer had solidified the bond with her audience. Patti next went into a positively electrifying rendition of Bob Dylan’s “Wicked Messenger” (a la Hendrix’s version of “All Along the Watchtower”). The slightly flawed ending gave her the opportunity to extend her effusive rapport with the crowd. “I kinda messed that up … maybe I’ll have to come back to Saint Louis and do it right” – uproarious cheers from the patrons. As the program progressed, Smith rocked, read and reeled through a comprehensive succession of her songs and poems. Her material spanned all the way back to “Horses” from her 1975 debut album of the same name. But the emphasis seemed to be on her latest release Gung Ho. Topics from that collection were accented by an accompanying light show. The visual projections at times splashed images of Ho Chi Minh and also scenes from civil rights clashes in the 1960’s. The backdrop for the stage was a huge American flag. During many of her numbers, the swirling psychedelic patterns reminiscent of decades past Trip Festivals lit on the performers and the background. In addition to vocally romping through a replete assemblage of her most spirited work, Patti occasionally played acoustic or electric guitar also. Adding a vivid underling to her entrenchment in the role of primo garage rock girl. Throughout the show Smith interjected banter with her audience; whether to introduce “Grateful” with a Jerry Garcia vision anecdote or to comment on the William Burroughs connection. “It’s a beautiful cemetery… here where William’s buried… you guys are lucky to have him here.” After holding up a copy of her Early Works 1970- 1979 to show a photo of Burroughs; she then read “Psalm 23 Revisited”, her tribute to the literary outlaw. Sometime during this rock and roll harangue, Smith made the audience aware of voter registration rosters available at Mississippi Nights. “Sign up”, she entreated, “… even if you write in a name – vote!” It was a testament to the devotion of her fans and the integrity of Patti Smith’s transcendent art; that this consummate cultural bellwether could reconcile denouncements of flimflam consumerism with encouragement to participate in a plutocratic political system. The irony almost stole the show.